That I went into Starbucks this morning. I usually get Starbucks as a weekly treat for myself since I have been trying to watch my pennys. Well last year I found this. 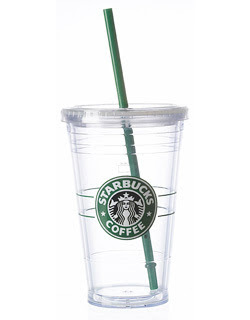 It is a double insulated plastic cup. You think it's just a cup. But that is where you are wrong my friend. The double insulation prevents your cold, frosty beverage from getting dewy, sweaty and warm. Well I thought it was the coolest thing and waffled on whether or not I should buy it because I think last year they were being sold for $10. Well that waffling my friends cost me. I went back a week later and they no longer had them. I scoured all the Starbucks within a 5 mile radius of my house and they were sold out as well. So one day I asked the barista if they were going to get anymore. She said they sold out within the first 30 minutes of putting them on the shelf. NOOOOOOOOOO! I was so adamant about getting my hands on one of these that I even e-mailed the corporate offices to see if they were going to bring them back. They told me that they did not plan on producing anymore of these cups. I was so disappointed. My cheapness got the best of me. So fast forward to this morning...I went in to get my tall peppermint mocha but the power was out so they couldn't steam anything. So as I'm walking out, the clear plastic caught my eye. I first let out a gasp and then I think I let out an audible little squeal. They brought them back! So there was no way I was going to let my cheapness stop me this time. I got two grande cups. I bought one for me and one for a co-worker who frequently gets a mocha frappacino. There was no way I was going to let the opportunity to buy one of these pass me by....AGAIN. So I am now sipping on a iced Tazo Refresh Tea in my new double insulated tumbler.